Myeloma cast nephropathy demonstrating light-chain restriction in the casts. The cast stained with κ Ig light chain (A) shows bright (3+) staining. The same cast stained in a serial section for λ light chain (B) is negative. Myeloma cast nephropathy. The eosinophilic casts are “fractured” into plate-like fragments that suggest that they are “brittle.” The tubules are atrophic with flattened epithelium, and the interstitium is fibrotic with a sparse lymphocytic infiltrate. Hematoxylin and eosin stain. 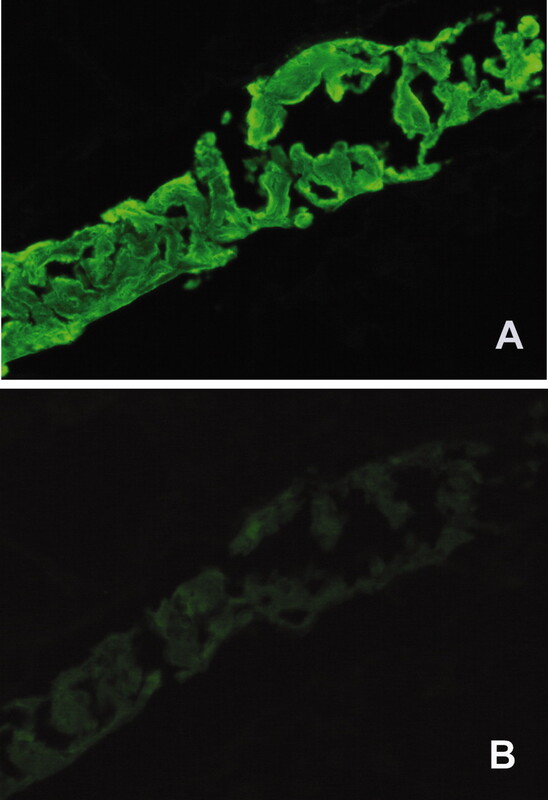 Monoclonal Ig deposition disease (MIDD) with diffuse and nodular glomerulosclerosis. There is prominent diffuse mesangial expansion by periodic acid-Schiff–positive matrix that focally forms nodules. 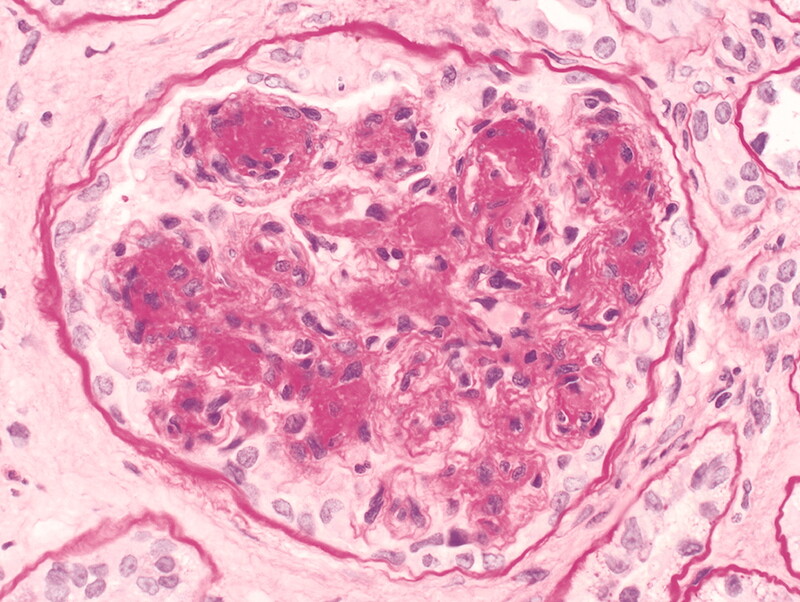 Although the glomerulus shows atrophy with some capillary collapse, the resemblance to diabetic glomerulosclerosis is obvious. 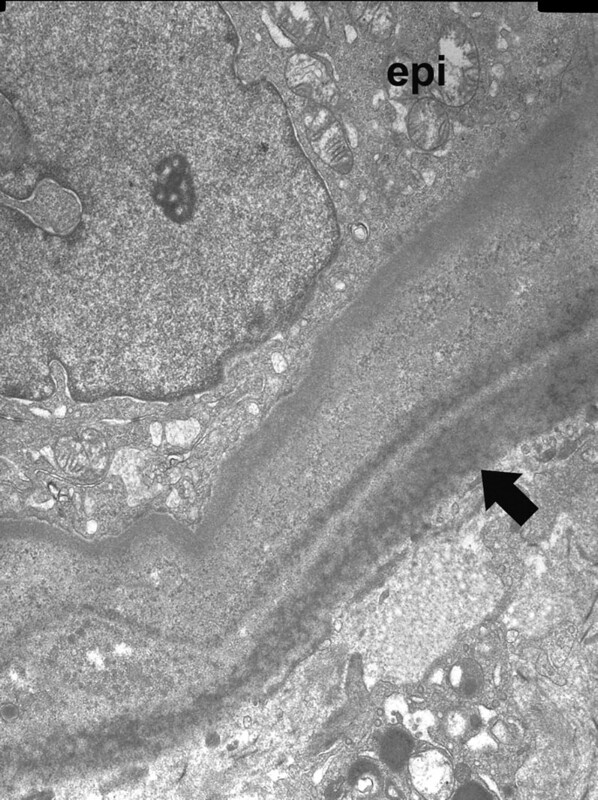 There were monoclonal deposits of κ Ig light chains in the glomerular and tubular basement membranes, and there were typical punctuate deposits in the basement membranes seen by electron microscopy. Periodic acid-Schiff stain. Courtesy of Jean L. Olson, University of California San Francisco, School of Medicine, San Francisco, California. 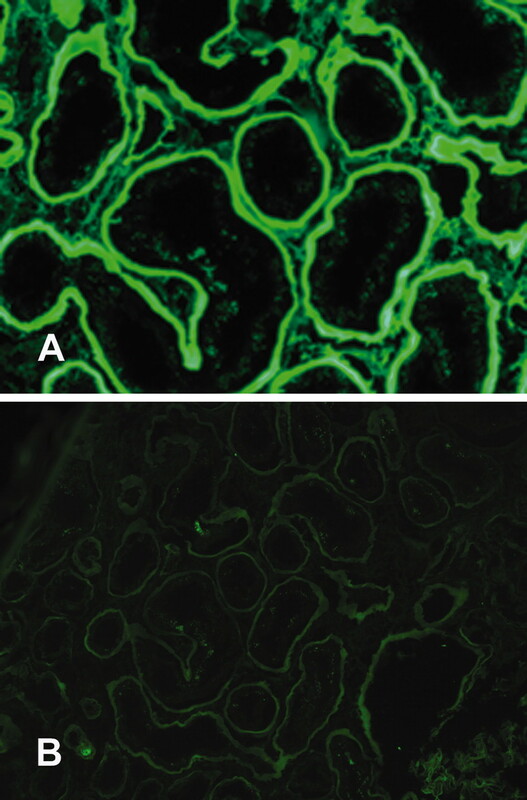 MIDD showing light chain restriction by immunofluorescence microscopy. The tubular basement membranes stained with κ Ig light chain (A) show bright (3+) staining. The tubular basement membranes stained for λ light chain (B) are negative. MIDD, ultrastructural appearance of the deposits. The tubular epithelium (epi) is separated from the interstitium by a grossly thickened basement membrane, and the punctuate, electron-dense deposits (arrow) are concentrated on the interstitial side of the basement membrane. Renal amyloidosis, Congo red birefringence. 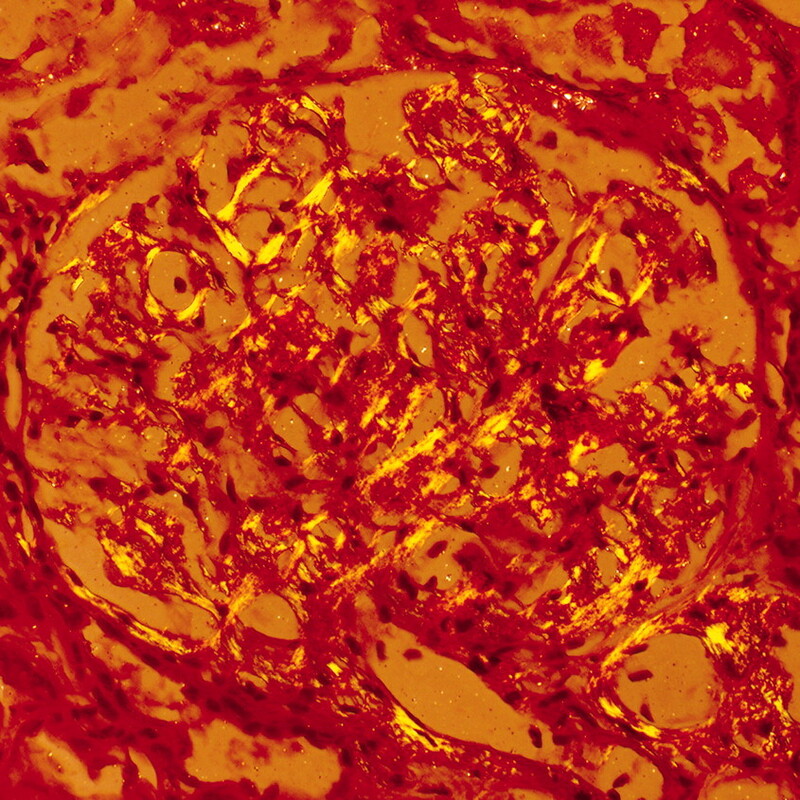 Glomerulus stained with Congo red demonstrates green birefringence when viewed through crossed Polaroid filters. Renal amyloidosis, ultrastructural appearance. 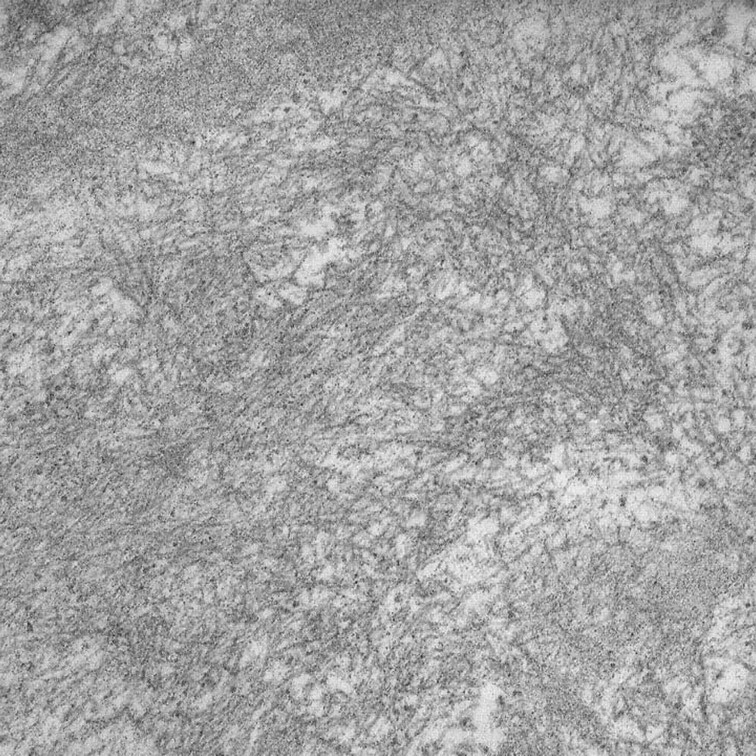 Amyloid deposits are seen as randomly arranged, 10-nM fibrils of indefinite length when viewed at high magnification by electron microscopy. Magnification, ×30,000. ↵a Data from reference (20). LCDD, light-chain deposition disease.